I recently acquired an Asahiflex IIa kit. It seems to be an original kit – the previous owner bought it many years ago as a single lot and did not add to it. 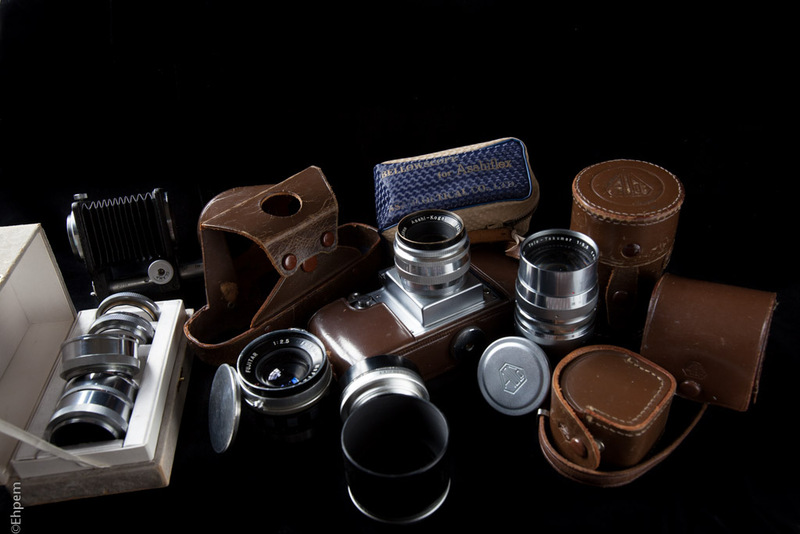 Included are three lenses with cases and hoods, extension tubes, bellows, a manual and a contemporary light meter. Also included with the sale to me is an Asahiflex IIb body for parts only as it has bits missing, and a more recent Vivitar 2800 flash that I think was just tossed in the camera case and forgotten – it had very badly leaking batteries. A few weeks after buying the camera the man I bought it from contacted me to say he had found the manual, a lens case, the parts body and some filters that might be from the camera, all of which he gave to me at no extra charge. The filters turned out to not fit, but one of them fits on my original Olympus Pen. The IIb parts body is invaluable as many of its components are the same as the IIa. The manual is available on-line in various places, but I have scanned it and you can see it here if you want, though the file is more than 8mb. This camera is beautifully made, heavy with very tight tolerances in all the moving parts. It is a very satisfying camera to hold and to turn dials and knobs and so on. I am expecting it to be a pleasure to use, other than issues around focusing the waist level view finder. The lenses are the same quality, heavy but very small, very well constructed and with a reputation for being sharp. The ergonomics of the camera are similar to the Pentax Spotmatics that I have used for decades, so the camera, while significantly different, feels familiar in the hand. Unfortunately, my IIa shutter speeds are very slow (a problem common to nearly all of these cameras) with all the fast speeds (1/500 to 1/25th) measured as ~1/30th by my local vintage camera store Camera Traders. I was thinking of shooting a test roll of 50 ISO film at 1/30th but when I found out the local camera repair store (Victoria Camera Service) was able to work on it (albeit through an associate in Vancouver) I sent both bodies off, one for repair the other for parts if needed, where they will be for a few more weeks. In the meantime I have ordered an adapter so I can try the lenses on other cameras, but it got lost in transit (it shipped 6 weeks ago) and another one is wending a seasonally slow route to me so I just have to be patient. In the meantime I thought I would describe the kit, and later I will publish lens tests and ultimately a camera test (unless the camera is finished before the adapter arrives). The lenses have the unusual 37 mm (m37) screw mount but adapters to m42 are available. I have m42 to EOS adapters for my old Spotmatic and other lenses. To use the Asahiflex lenses on my digital cameras I will insert an m37 to m42 adapter in an m42 to EOS adapter. I expect it will not be as tight and stable as one would like, and it sounds like there are often (manageable) issues with light leaks around the adapters due to the small diameter of the lenses. Asahiflex IIa body with leather case that has embossed logo for AOCo (Asahi Optical Company). Asahiflex IIb body, parts only. Asahi-Kogaku Takumar 58/2.4 lens with hood (hood in a leather case, embossed logo), but no caps or case for the lens. Asahi_Kogaku Tele-Takumar 135/3.5 lens with hood (hood in leather case, embossed logo), both aluminum caps, slip on front cap with logo and screw-in rear, embossed leather case for lens. Fujitar P.C 35/2.5 lens; both aluminum screw-in caps, leather case embossed Fujita Kogaku, around the rear element of the lens is inscribed: “FOR ASAHI FLEX IIA IIB”. I understand this same lens is known to bear other names including Fujita, Tower (the Sears label used for the Asahiflex bodies) and others. Set of 4 extension tubes in original box labelled as AOCo for Asahiflex. Asahiflex Bellowscope bellows unit with original soft case labelled for Asahiflex. Asahiflex manual “Instruction Asahi Flex, Asahi Optical Co., Ltd. No. 980, Shimura-Maenocho, Itabashi-ku, Tokyo, Japan. Printed by Hosokawa, Tokyo, Japan“, indicates inside it is for “Asahiflex Model II” with reference to both the IIA and IIB variants. Taped into it are two pages from the extension tube instruction manual. Agfa Lucimeter S light meter; with strap but no case or diffuser, still working. The Asahiflex cameras first came out in 1952 with the Asahiflex I, followed by the Ia in 1953, the IIb in 1954 and the IIa in 1955. The IIa and IIb remained in production to 1957 when they were replaced by very similar penta prism cameras; early models of the Pentax (see this link for a history of the various models). 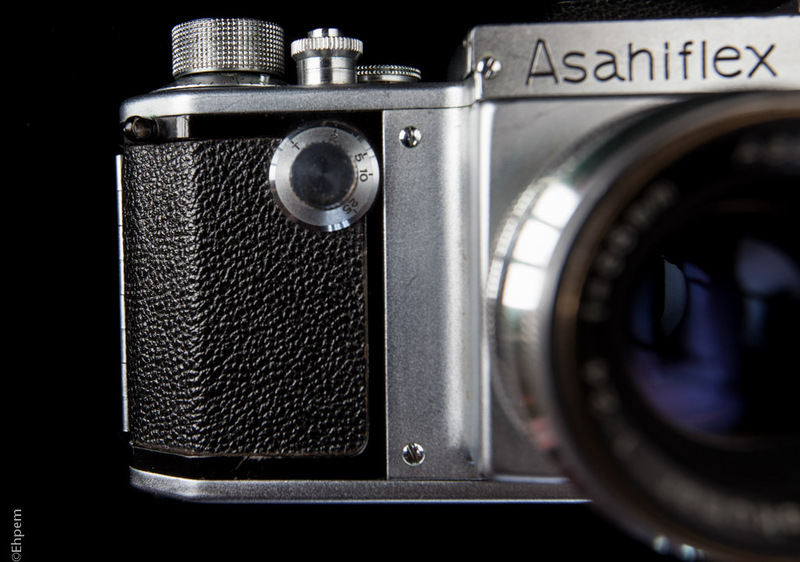 All Asahiflex models have waist level viewfinders for framing and focusing, with a pop-out magnifier for detailed focus. They also have an eye level view finder for tracking moving subjects after focus has been established. Below is a slide show (might be slow loading) that shows the finder closed, open, and with magnifier. The IIa is the last Asahiflex model, coming out after the IIb. The II models have instant return mirrors and standard flash sync sockets whereas for the Asahiflex I models the mirror is put in place for focusing by advancing the film and the flash sync socket (on the I) and sockets (Ia) are non-standard. 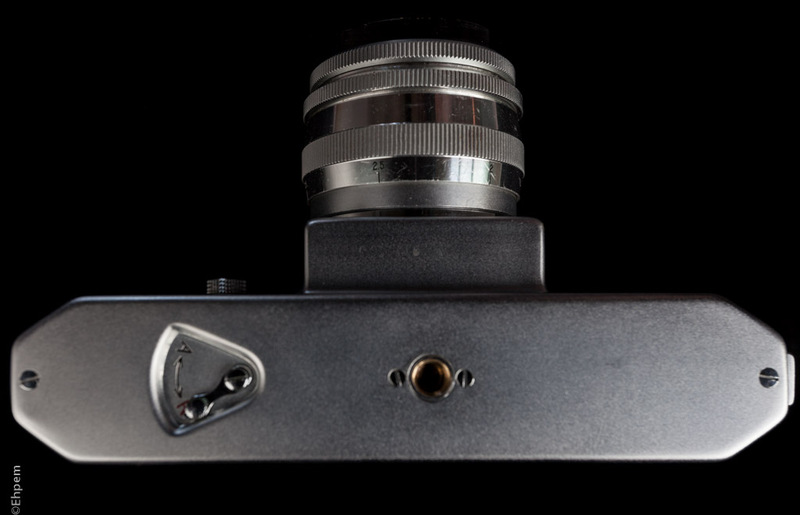 The difference between the version II models is that the IIa has a slow speed dial on the front of the camera. The slow speed dial allows speeds of T, B, 1/2, 1/5, 1/10, 1/25. All models have on the top speed dial speeds of B, 1/25, 1/50, 1/100, 1/200, 1/500 with flash sync at 1/50th. The shutter is a horizontal focal plane cloth shutter. 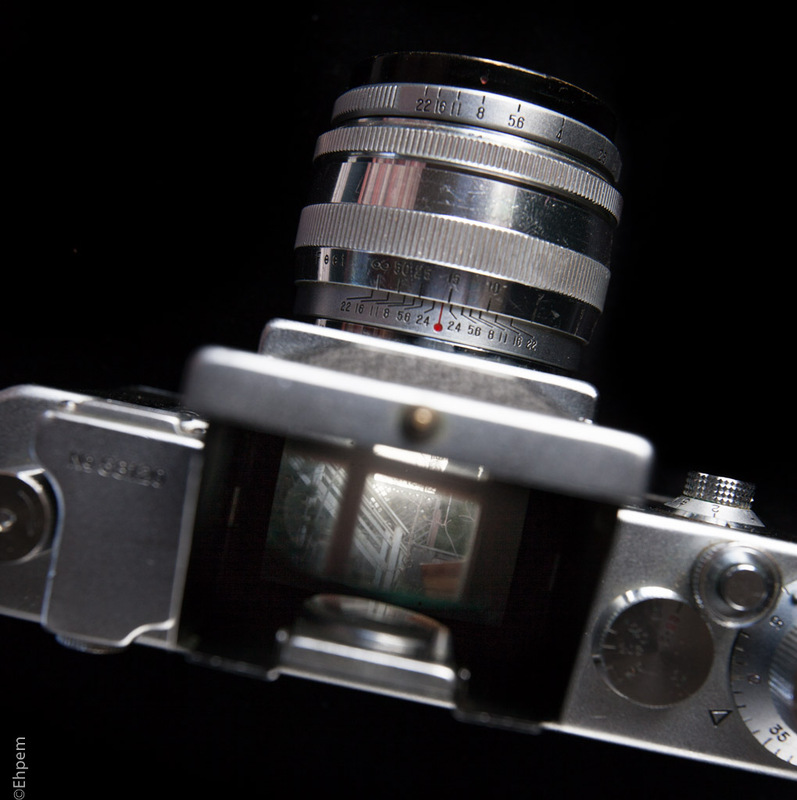 The Asahiflex IIs are often billed as the first 35mm camera with an instant return mirror. This is somewhat controversial (in the tiny world of people that care) since there is an instant return Hungarian camera that was produced in very small quantities starting in 1947. Also, there are slightly earlier cameras like the Praktiflex which has a mirror that returns when you let go of the shutter button. These are technically referred to as a fast-return mirror and functionally are little different from the instant return mirror which returns as soon as the shutter closes, regardless of whether the shutter button is still depressed. However, the fast-return shutter release has a longer and stiffer throw because pressing the shutter also mechanically lifts the mirror, so they are a bit more cumbersome to use. Many fast return mirrors rely on gravity for their return and thus may not fall into place when used in portrait mode. And, if the shutter button is released before the shutter has closed, then the mirror returns and ruins longer exposures. Regardless, the Asahiflex II models were instrumental in setting the standard for such technology which is now ubiquitous on all SLR cameras. The Asahiflex cameras use 135 film which is advanced with a knob rather than a lever. There is double exposure protection, but this can be turned off by switching the film rewind lever on the bottom to “R” which disengages the film advance sprockets for however many multiple exposures you care to take. The film counter is set manually once the film is loaded. The lenses are all preset lenses. The way these work is that you decide what exposure you would like, set the f/stop on the lens preset ring and then open the lens up to allow enough light for framing and focusing. Once that is sorted you can turn the aperture ring which stops at the preset, without taking your eye off the viewfinder. In the Takumar lenses the preset is done with a ring on the outer part of the lens, but on the Fujitar aperture lock is achieved with a button on the side of the lens. Asahiflex never manufactured a wide angle lens, so the Fujitar 35mm was marketed, under different brand names, as being for the Asahiflex. My version is also stamped next to the rear element as being for the Asahiflex IIa and IIb. Asahiflex did make a 5o/3.5, 58/2.4, 83/1.9, 100/3.5, 135/3.5 and 500/5. The 83 and 500 are quite rare and the 100 is not nearly as common as the 135. The 50 is the most common lens available. The 58 is a heliar-type design, considered very fast for that type. Heliar-type lenses are quite desirable for the way they render the image and bokeh, and are especially desired for portrait work. So it is nice to have one that fits 35 mm (I have an original, or nearly original, Voigtländer Heliar from the early 1900s for a 4×5 camera I bought 30 years ago but have not yet refurbished and used). I will be testing the lenses individually when I get an adapter and will do a post about each lens with examples of the photos they take and some more information about them. Some of these lenses are quite rare and thus information is in short supply on the web, especially the Fujitar (or Fujita) 35/2.5. The camera came with an Agfa Lucimeter S match-needle light meter, a model that was introduced about 1958, so more or less contemporaneous to the camera and thus I think it is probably part of the original kit. It is not in great shape with a cracked cover, no case and missing diffuser for incident light readings. The window had collapsed interfering with needle movement, but I was able to take it apart and make it work again. It appears to be accurate when compared to Sunny 16 rules. The meter has a selenium sensor that is sensitive from ISO (ASA) 10 to 2000, speeds 1/1000 to 8 seconds and apertures ranging from f/1.4 to f/32. When I test the camera I will be using this meter, at least in part, as that seems only right. Also in the kit are close-up devices including a “Bellowscope” which is a collapsible bellows unit in its original soft case and a set of four extension tubes in their original box. The bellows are marked for magnification when using the 50mm and 100mm lenses, neither of which I have but I am sure I can interpolate if I need to. The manual has two pages from the extension tubes manual taped in, including the table for exposure compensation using the 58mm lens that has 15 different combinations of tubes, object size, lens to object distance, magnification and exposure factor. I take this to be evidence that the extension tubes are part of the original kit as this is essential information for calculating exposures for macrophotography. An interest in close-up photography by the original owner also suggests that the Bellowscope is original kit. As with the lenses, I will test these devices too and write about them separately. I am not sure if I will keep this camera, or whether eventually I will try to convert its value into a camera that I can happily use every day and which I cannot otherwise afford (like a Leica M6). I am mentally preparing to purge a lot of cameras from around here that I rarely use and putting the sales into a fund for a high-end film camera. Which means I am open for business and if someone sees in my blog a film camera they would like to have, make me an offer (email here). I will say right off, this does not include the Olympus Pen, XA, one of my XA2’s, mjuii, Canon Elan 7N, EOS3, Nikon FM, Kodak Vest Pocket B, Mamiya M645 Super and a couple of other cameras that I either use a lot or which have sentimental value. To open gallery of images below click on any image and then navigate with the arrows. Escape to exit. My first camera – a 21st birthday present from my Dad was an Asahi Pentax S1a. It had a clip-on light meter that sat on top of the prism housing. That camera went to the Himalayas with me and performed faultlessly with spot-on exposure readings in a variety of conditions. Later cameras were much less reliable. Hi Andy – the early Spotmatics were built very well too – I used them in the field for a couple of decades, dropped them more than once and generally banged them about and never had one fail in the field. Beautiful pictures of the kit, too! Thanks Peter! I find it fun to take these kinds of photos, all with natural light which can have limitations. A stellar find! Good luck with its overhaul. I look forward to seeing images from it. I agree, it is a stellar find. It sounds like the shutter speeds can be fixed so I am expecting to take pictures with it next month. In the meantime I am getting the chance to learn about the lenses (the m37>m42 adapter just arrived!) so that is a useful step towards using the camera.